No 24 months in this camp! Stop deportations! No to racism and torture of migrants! On Friday 15th December 2017 around 200 people from Sierra Leone – women, men and children – started a ‘strike of closed doors’ in the Deggendorf transit camp against the inhumane conditions and against rejections and deportations. On Wednesday 20th December their protest was joined by other refugees/migrants in the Deggendorf camp, refugees/migrants from other Bavarian camps – of different West African, Arab and Caucasian nationalities – and by activist groups. The peaceful protest marched across the town of Deggendorf in six hours, visiting key institutions: The BAMF (Federal Office for Migration and Refugees), via the Landratsamt (Foreigners’ Office), town hall, city center, the Caritas office and police station. The protesters objected the ongoing deportations and massive rejections of their asylum applications (DULDUNG*) and the lack of medical care, the miserable hygienic conditions, lack of privacy and the bad quality of the food in the camp as well as the denial of normal schooling and work permits. They refused the new policy to keep people in the transit camp for up to 24 months. 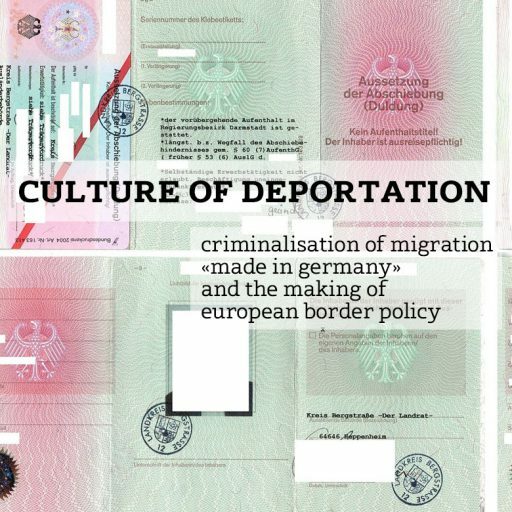 Since July 2017 a new German law (Gesetz zur besseren Durchsetzung der Ausreisepflicht) has given the Bavarian state the possibility to imprison people in integrated „reception“ and deportation facilities under one roof. In these factual deportation camps Bavaria accomodates asylum seekers from countries with less than 50 % approval rate (see BLEIBEPERSPEKTIVE*), that is, from most countries of origin. Basic rights violations in these camps include: Inhabitants are not allowed to leave the town limits without a special permission (RESIDENZPFLICHT*), not allowed to work nor study, nor are entitled to social support or normal medical care. This system of segregation and quasi-imprisonment has sparked several protests in the Bavarian camps. The initial group of Sierra Leoneans in Deggendorf had gone on hunger strike on Saturday 16th December, after starting the ‘strike of closed doors’ on Friday 15th December. In protest, the children and young people were refusing to attend the German class in the camp as access to regular educational institutions was denied from them. Adults stayed in the accommodation and refused to work in the 80 cents jobs. The protest began after the violent deportation of a man from Sierra Leone on the morning of 15th December, which had been stopped in the last minute at the airport. – The next point is that we now stay in a camp for 2 years instead of the initial 6 months, with no schooling, no work permit. – Very poor accommodation facilities with 8 occupants in a room, with poor hygiene and toilet facilities. – Very poor quality of food. – Deportation to Italy with serious torture and no proper arrangements for reinstatement of the immigrants in Italy thereby leaving the immigrants on the street suffering. Forceful deportation of pregnant women, children, sick people and sucking mothers. – No medication for immigrants for certain sickness. And now established to us that this is a private camp and cannot allow any journalists. On this basis we have started on 15th December 2017 a close door strike with no schooling and on Saturday 16th December and Sunday 17th December hunger strike and on Monday, we will be going to city council to get clearances to have a peaceful protest accross Deggendorf with continuation of no schooling and hunger strike.